Australia is a dynamic and commodity-rich nation, whose wealth of natural resources has historically created the opportunity for government and corporations to embark upon major infrastructure and construction projects. For the past decade, the country's approach to infrastructure development has been focused on access to commodities for export. However, Australia's economy is presently one that is in transition (and to some extent is playing catch up), which in recent times has embraced renewables projects, with a push by the construction sector to upskill and take advantage of this burgeoning market. As a number of the major project works relating to mining and gas developments are now well into the operational phase, significant federal, state and local government funding has been directed to fill the gap by focusing on urban transport and renewal projects in the metropolitan centres. Coupled with this is the resurgence of the tourism sector and private sector funding, particularly from Asia into the cultural sector. This rebalancing brings opportunities for the construction sector to shift its focus towards renewables, infrastructure (such as road, rail and telecommunications projects)and tourism, which, in recent years, have not attracted the investment required to cater for increased population growth. By 2031, more than 30 million people will call Australia home. All levels of government are therefore assessing requirements of the community across the country, with a number of multibillion-dollar nation-shaping projects currently being undertaken, predominantly relating to urban congestion and national and regional connectivity. These include large metro and light rail projects in the capital cities, the roll-out of the National Broadband Network (NBN), and improved airport and port access for new freight links. Australia has a sophisticated legal and regulatory framework in place to govern such projects and their proponents. It remains a jurisdiction in which projects can be completed with minimal sovereign risk and therefore remains an attractive destination for foreign investment. Any discussion about Australia's legal and regulatory landscape must be prefaced with an explanation of its status as a federation. Australia consists of six states (Queensland, New South Wales, Victoria, South Australia, Western Australia and Tasmania) and two self-governing territories (the Australian Capital Territory and the Northern Territory). Each state and territory has its own legislative, judicial and executive arms of government. There are three levels of government present in Australia: federal, state and local. The federal government's legislative powers are constrained by the Australian Constitution and include subjects as diverse as corporations, defence, taxation, telecommunications, immigration, foreign affairs and trade. The state governments have unfettered legislative jurisdiction, subject to the qualification that federal legislation will prevail over state legislation to the extent of any inconsistencies. Local governments are primarily responsible for planning and development, and the provision of local services to communities. Australia has a common law system, which it inherited from the United Kingdom. Each Australian state and territory has its own courts, appeals from which may be heard in the High Court of Australia. In addition, there are federal courts that hear matters arising under federal laws. The real game changer in 2017 was Australia's shift in sentiment towards renewables, with increased support at both federal and state levels creating more certainty for industry and in turn a greater appetite for investment. The government's renewable energy target requires that by 2020 at least 23.5 per cent of Australia's electricity will be generated by renewable sources. We are even seeing major international resource houses who have traditionally worked in the coal sector moving into renewable energy. Indian energy giant Adani, for example, is developing two solar generation plants, one near Moranbah in Central Queensland and the other on the northern outskirts of Whyalla in South Australia. Even local government authorities are getting involved in this area, with the Sunshine Coast Council, among others, implementing a new solar-powered lighting system. ESCO Pacific and Elliott Advisers' 98MW Susan River Solar Farm and 75MW Childers Solar Farm, both located in Queensland. Construction will commence in 2018 and is expected to take nine months. French developer Neoen's three big solar projects – Parkes Solar Farm, Griffith Solar Farm and Dubbo Solar Hub – which are being built in New South Wales and will total as much as 165MW of generating capacity. Neoen is fast-tracking these projects. FRV's 150MW Lilyvale solar farm – the first large-scale solar development proposed for Queensland's Central Highlands region and one of the largest projects of its kind planned for Australia. Genex Power's Kidston Solar Project, which involves the development of a 50MW solar farm on the site of the historical Kidston Gold Mine, located approximately 270km north-west of Townsville in northern Queensland. South Australia, which has had highly publicised energy reliability issues, was central to the launch of the world's largest lithium-ion battery in late 2017. Tesla's much-anticipated 'mega battery' made the '100 days or it's free' deadline, after a week of testing and commissioning. The project has attracted a lot of attention, both in Australia and overseas, and the construction sector is now watching closely in anticipation to see what impact the battery has on energy policy in other states. This is not to say that resources projects have completely dried up. In fact, some of the largest mining projects in the world are under construction or about to start development in Australia. For example, Adani's Carmichael Coal project is being constructed as a 60 million-tonne (product) per annum coal mine, including both underground and open-cut mining. Coal will be transported to port facilities via a privately owned rail line that is connected to the existing rail infrastructure. There is also an increased interest by miners in metals projects outside of the traditional iron ore space. In New South Wales, for example, Bowdens Silver is undertaking the approval process of one of the largest undeveloped primary silver deposits in Australia. Much of the talk about energy is largely the result of Australia's steady population growth and how the major cities will cope with the forecast growth. The past year therefore saw significant government and private funding being invested into social and transport projects. Three kilometres of George Street in Sydney is occupied by building sites. The street is the site of the major extension of the A$2 billion Sydney Light Rail network through the city and to the eastern suburbs and will be completed in early 2019. Light rail (trams), which was once Australia's most popular form of public transport until the car, is now back in vogue as the Australian and various state and local governments try to move personal vehicles off roads in the central business districts (CBDs) and encourage commuters to utilise efficient public transport networks. Rail construction as a whole has seen a revival, with significant projects aimed at creating increased connectivity between capital cities and outer suburbs, such as the 12.6km Moreton Bay Rail Link in Queensland and, of course, Australia's largest public transport project – the A$12 billion Sydney Metro, which involves the underground construction of rail line spanning 75km. Construction is progressing on the A$2 billion Forrestfield to Perth rail link, which will connect Forrestfield to the city, opening up Perth's eastern suburbs to the rail network for the first time. In Brisbane, known as the 'River City', work has now begun on the long-awaited Cross River Rail, which will be an underground rail line through central Brisbane. The A$5 billion project involves building a new 5.4km tunnel under the Brisbane River and the Brisbane CBD, creating five new inner-city station precincts. Nationally, following market testing a new key piece of major freight infrastructure will be constructed that will link Melbourne to Brisbane via central-west New South Wales and Toowoomba, a significant investment by the federal government for this A$10 billion Inland Rail project. Even more recently, in April 2018, the government promised A$5 billion for a Melbourne airport train line to expedite the commute from the airports to the CBD. Australia's road network has also received significant funding to deal with increased traffic congestion. WestConnex in Sydney involves widening and extending the M4 Western Motorway, a new section for the M5 South Western Motorway and a new bypass of the Sydney CBD connecting the M4 and M5. These projects will build or upgrade approximately 33km (predominantly underground) of the Sydney motorway network with an estimated value of A$20 billion. There are also major upgrades of the Pacific Highway between Sydney and Brisbane taking place. In Melbourne, the A$1.34 billion widening of the Tullamarine Freeway and Citylink (one of Melbourne's most heavily used roads, carrying approximately 210,000 vehicles per day) is nearing completion. This theme of connectivity through social infrastructure is helping to shape the Australian construction sector. Telecommunications provides an obvious example of this as the roll-out of the NBN continues across the country with more than 3 million activations. This A$30 billion project is delivering Australia's first national wholesale-only, open-access broadband network to all Australians. It has been important for the construction sector to have these nation-building government-funded projects as the residential building sector starts to plateau given the massive increase in multi-unit dwelling construction during the past five years. However, this does not mean that building projects have declined. Far from it. In New South Wales, the next stage of the Barangaroo commercial, residential and parkland development has created what could be seen as a satellite CBD on the edge of the current CBD and the next stage will include the construction of Sydney's first six-star hotel and casino. Sydney's other major urban renewal project, one of the largest in the world, the Bays, sits just 2km west of the city and consists of 95 hectares of largely government-owned land, being transformed into a technology hub and other uses. There is also what can only be described as the creation of whole new suburbs on former industrial land in some cities, such as Sydney's first new town centre in almost 100 years – Green Square, 4.5km from the CBD – and in Brisbane the Newstead commercial, retail and residential development on the site of a former gasworks. Particular mention should be made of western Sydney, which is a major growth area. The federal and New South Wales governments are funding a 10-year, A$3.6 billion road investment programme for the area. The Western Sydney Infrastructure Plan will deliver major road infrastructure upgrades to support an integrated transport solution for the region and capitalise on the economic benefits from developing the proposed Western Sydney Airport at Badgerys Creek. Western Sydney also has the A$2 billion Parramatta Square redevelopment. Another major geographical growth area has been and will continue to be the Northern Territory. Current major projects include the Darwin luxury hotel development; the Darwin Port lease; the Inpex LNG project, which is nearing completion; the Mount Isa to Tennant Creek railway project; the Northern Gas Pipeline; the Palmerston Regional Hospital project; and the Royal Darwin Hospital Expansion project. The federal government's A$5 billion loan programme to support infrastructure projects in northern Australia combined with the Northern Territory White Paper, which sets out a policy platform for realising the full economic potential of northern Australia, also promises to create exciting opportunities for economic development in the territory. The Northern Territory strategically benefits from physically neighbouring the Asian economies and is well positioned as a transport and logistics hub for business and tourism. With the Australian dollar trading much lower against the US dollar than in previous years and Queensland's second-largest city, the Gold Coast, having just hosted the 2018 Commonwealth Games, there has been a revival in the tourism and cultural sectors across Australia. It is no surprise that Chinese investment in this area has led the way. The most impressive examples of this are Dalian Wanda's redevelopment of Gold Fields House, Fairfax House and the rugby club at Circular Quay in Sydney into a five-star hotel tower and mixed-use residential tower, and Wanda Ridong's Jewel, which will comprise three towers including a five-star hotel with 170 rooms, more than 500 residential apartments and high-end retail spaces. Jewel is the first beachfront residential resort to be constructed on the Gold Coast in more than 30 years. Work has also started on IHG's Holiday Inn Sydney Central, which will be a 305-room hotel developed by China's Linzhu group in the Central Park precinct at the southern end of the CBD. Nowhere in Australia is tourism helping to shape the skyline more than in Australia's 'new world city', Brisbane, where Star Entertainment Group, Far East Consortium (Australia) and Chow Tai Fook Enterprises are facilitating the delivery of the Queen's Wharf Brisbane integrated resort development with works under way since 2017. The development includes five new premium hotel brands, notably the Ritz Carlton, and Brisbane's first six-star hotel. North Queenslanders have been waiting decades for a new stadium in Townsville to host rugby league games and construction has now started. In Perth, the construction of Perth Stadium and Sports Precinct has concluded. Cranes from large building projects are casting shadows across the skylines of Australia's capital cities: from the A$1.2 billion Perth New Children's Hospital to the A$700 million Darling Harbour hotel known as The Ribbon, which is being built between the ramps of the Western Distributor Freeway. There is also the demolition and rebuild of the Sydney Football Stadium at Moore Park, the refurbishment of the ANZ Stadium at Sydney Olympic Park and the construction of a 30,000 seat stadium at Parramatta. It is clear that during the past year Australia's infrastructure sector has become more balanced, with a much greater range of projects across roads, rail, renewables and commercial building. Corporations undertaking projects physically located in Australia would normally utilise one or more Australian-resident companies as the primary participants in the structure, particularly for the owners and operators of assets, but also for major contractors involved in construction. Where there is a sole project owner, separate Australian subsidiary companies may be utilised by the project owner to conduct different aspects of the project. For example, separate subsidiaries may own the project assets, act as a financing vehicle to hold internal or external debt to fund the project and employ labour. Similarly, in certain projects it is common to have a separate operator that outsources some or all of the day-to-day operations to third-party service providers. The use of separate corporate entities in an onshore Australia group structure may facilitate the limitation of liability, ring-fence specific risks, simplify project financing and meet other commercial objectives. Where a project has multiple equity investors, the structure may commercially be referred to as a joint venture. A joint venture can encompass a wide range of legal structures. Joint venture structures can take the form of an incorporated joint venture, which involves one or more special purpose project companies, the shares in each of which are owned by multiple equity investors in the same proportions. In such cases, relations between the shareholders and their conduct would be governed by a contractual shareholders' agreement. Under the Australian taxation system, an incorporated joint venture company or corporate group cannot be treated as a pass-through entity. As a result, the losses and depreciation of an incorporated joint venture or structure are trapped within the entity or structure. While a number of Australian states allow for the formation of limited partnerships, they are taxed at the same rate as corporations (currently 30 per cent). Where there is a desire for a flow-through of gains, losses and depreciation to underlying owners, an unincorporated joint venture structure is most often utilised. This is of particular importance where an investor has other Australian interests and there is a desire to offset taxable profit, losses and deductions from different projects in which the investor has an interest. Unincorporated joint ventures are particularly common in the mining and oil and gas industries. The unincorporated joint venture is a commonly understood structure and is familiar to investors, local advisers and regulatory authorities, as well as to banks and project financiers. In mining joint venture structures, each unrelated participant will undertake to contribute, by way of cash calls, its proportion of the relevant costs of developing and operating a mine. A separate corporate manager (that is often owned by the participants in the same proportions as their interest in the joint venture) would normally be appointed to undertake the day-to-day activities of the project as agent for the participants. Each participant then takes its share of the output from the mine and, depending on the contractual terms, may have an ability to deal with it separately. In some cases, though, each participant will appoint the same sales agent (also often a corporate vehicle owned by the participants in the same proportions as their interest in the joint venture) to sell its share of the product to third parties. Under this incorporated joint venture structure, each participant includes in its own tax calculations its share of the costs and depreciation deductions of the project and separately accounts for its own proceeds from the sale of the product. In cases where it is not feasible to take a separate share of the output of the relevant project (such as projects for the construction of an infrastructure asset where there is a single revenue stream), an unincorporated joint venture will be considered to be a partnership for tax purposes and a separate return is required to be lodged on behalf of the joint venture. However, there is a flow-through of the income or loss from the project if this is the case. Another structure commonly used where there are multiple investors in an infrastructure asset with a positive cash flow and income stream is a fixed unit trust. These trusts facilitate the distribution of free cash in excess of the taxable income of the project, without immediate tax consequences for investors where, for example, the tax income is partially sheltered by depreciation or capital works deductions for infrastructure. Traditionally, projects within Australia have been undertaken pursuant to standard form contracts published by Standards Australia. These standard form documents have over time been heavily amended to reflect the decisions that have been handed down by the courts. While Australian Standard contracts remain the most commonly utilised agreements for large commercial projects within Australia, as a result of the increasing involvement of international engineering-procurement-construction-management (EPCM) contractors on Australian major projects, the contractual landscape has been modified. There has been an increased importation of bespoke contracts that reflect the contractual environment of the EPCM contractors' home jurisdictions. Despite a high degree of enthusiasm within the legal profession and industry bodies, the International Federation of Consulting Engineers (FIDIC) suite of standard form contracts is yet to be fully embraced in Australia. Instead, FIDIC contracts tend to be utilised by foreign companies engaging in business in Australia and by Australian-domiciled companies who have had exposure to the contracts as a result of their involvement in projects overseas. FIDIC contracts are commonly utilised on projects being undertaken in South East Asia. Limitation of liability clauses are commonly incorporated into contracts as a method of managing risk. Contractors will generally seek to limit their liability by including 'caps' in their contracts both on aggregate liability and on the amount of liquidated damages that may be levied against them in the event of late completion (the liquidated damages cap being generally between 5 and 10 per cent of the overall adjusted contract sum). It is also common for parties to limit their liability in respect of 'consequential loss' to avoid becoming exposed to claims for losses such as loss of profits, loss of use, loss of production and loss of revenue that may result from the way in which they conduct or administer a project. In the Australian context it is very important to identify the types of losses that are being excluded rather than use the term 'consequential loss', as the legal meaning of that term is far from settled in the various Australian jurisdictions and does not correspond to the equivalent meaning under English law. These provisions are particularly important in the mining and resources sector, because of the extent of the losses that can be caused by the shutdown of a mine, processing facility or associated rail infrastructure and the associated loss of production. Secured transactions are primarily governed by federal law in Australia; however, for transactions involving certain rights and industries (for instance, those involving mining rights) transactions are additionally regulated by state legislation. Legislation between each state differs, but there are often substantial similarities between each state's legislation. A number of years ago, Australia introduced a personal property securities regime similar to that already in place in Canada, New Zealand and some parts of the United States. The regime allows for and in some instances requires the registration of security interests in personal property. The definition of personal property extends essentially to any property other than land, with some limited exceptions. The legislation relies on the concepts of attachment and perfection in determining whether a security interest has been created. For a security interest to be enforceable against the grantor, the security interest must attach to the personal property being offered as collateral. Attachment occurs where the secured party is given value, the grantor has a transferable interest in the collateral and the grantor and secured party enter into a security agreement or the secured party has possession of the collateral. The interest must ordinarily then be perfected to allow the secured party to obtain priority against third parties. Perfection can occur by registration (the most usual method), possession or control (with the concept of control only being relevant to certain limited assets, such as shares). Unsurprisingly, the regime affects the structuring of financing arrangements and investments and the operations of contractors (foreign and national alike) in Australia. A lender taking security over Australian shares and assets (including income or contracts) will need to consider this regime carefully when structuring their lending arrangements in Australia. However, a wide range of standard contractual arrangements, outside the finance arena, are also potentially affected by the legislation. Contracts under which rights to obtain property arise on default (e.g., step-in rights), supply contracts with retention of title clauses, deferred-payment arrangements, subcontracting arrangements, equipment hire and leasing arrangements and joint ventures and shareholder agreements all potentially involve the granting of security interests, which may necessitate the registration of that interest for it to be enforceable against third parties. The regime also affects the holder of the legal title to the relevant assets where the holder has parted with possession of the relevant asset: the owner's title to that asset can be defeated by others, for example, by creditors on insolvency, third parties with a registered security interest in the property and third parties taking free of the owner's interest. The personal property securities regime is a relatively new area of law and there is ongoing debate in Australia as to whether certain interests will (or will not) amount to 'security interests' for the purposes of this regime. This will only be resolved by court consideration and legislative clarification over time. Until this doubt is resolved, there is an inherent risk that secured parties who do not adequately protect their security interest under the personal properties securities regime may lose their interest in the relevant goods to others who have adequately protected their interest under the regime. In an example of the evolving jurisprudence in this area, and an illustration of the risks incurred by owners of property who are leasing or hiring out that property to third parties and who do not adequately protect their interests in that property under the personal property securities regime, the New South Wales Court of Appeal2 recently held that the interests of the owner and lessor of four mobile turbine generator sets which had not registered its interest (under the lease arrangements) in those turbines vested in the lessee of those turbines immediately before the lessee entered into administration. Accordingly, the lessee (and its secured creditors, who had registered their security interests over the assets of the lessee) had better title to the turbines than the owner and lessor. In the Australian construction industry, security is generally given by contractors and subcontractors to parties above them in the contractual hierarchy. The Australian Standard suite of contracts contains provisions that allow for the bilateral granting of security, but this is rarely seen in practice. Typically, bank guarantees and, on large-scale projects, performance bonds are given by contractors and subcontractors to secure the performance of their contractual obligations (including the rectification of any defective work for an agreed term following the completion of the project, referred to as the 'defects liability period' or 'maintenance period'). Such instruments are irrevocable and commonly provided on an unconditional basis (although they can also be provided with attached conditions), meaning that they are effectively as good as cash in the hands of the beneficiary and can simply be presented at the issuing financial institution and converted without first obtaining the consent of the party who provided them. While courts are generally hesitant to restrain a party from having recourse to the security that they hold, they are prepared to grant injunctions in certain, limited circumstances (such as fraud, or where an unconscionable attempt is made to have recourse to security that would cause damage to the reputation of the party who provided it). There have been a number of recent court decisions considering the issue of security for performance and by extension, the notion that security requested under a construction contract is regarded as a form of risk mitigation in the event that there is a dispute at the conclusion of a project. Although some construction contracts provide for cash retentions to be deducted from progress payments that are made to contractors and subcontractors, such arrangements are uncommon on large-scale projects because of the impact that they may have on the contractor's cash flow. In some Australian jurisdictions, legislative provisions have been enacted to restrict the amount of security that a party to a construction contract may lawfully require another to provide, as well as the circumstances in which recourse may be had to the security that is withheld. In New South Wales, head contractors on projects whose value exceeds A$20 million are required to establish trust accounts into which retention monies that are withheld from subcontractors must be deposited. Under most contracts, a proportion of the withheld retention or security will become due for release upon the works reaching completion, with the balance becoming due following the expiry of the defects liability period (assuming that it has not been called upon prior to this date). Australia enjoys a stable commercial climate with few significant social issues that are likely to have an impact on project development. That said, greater scrutiny of a company's social licence to operate continues to drive reform from government and innovation from companies. 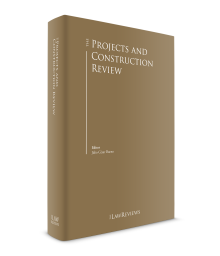 This section will detail what businesses involved in projects and construction may expect at the state and national levels of Australian government, as well as commonly recognised international standards relevant to project finance. Throughout Australia, state governments are the primary assessment and approval authority for new projects. In some circumstances, driven by the location of a project and the nature of its impacts, further assessment at the federal level may be triggered. That said, efforts continue to avoid duplication by establishing a 'one-stop shop' for environmental assessments. As part of a routine environmental impact assessment process for a significant project, independent environmental state government agencies are responsible for assessing environmental management and third-party stakeholders are invited to comment on the impacts. This allows landholders and interest groups to have their say on proposals and developments, adding motivation to ensure that early and effective stakeholder engagement is in place. In Australia, emissions and renewable energy policy tends to be driven from a state level, influencing national action. Precipitated by significant energy events such as the major outages in South Australia and calls from industry for government to address rising costs and availability issues, state governments have set renewable energy targets and are increasing their focus on large-scale renewable energy delivery developments. With vast renewable resources remaining largely untapped, significant inbound investment in renewables is occurring, although there remains scope to increase this interest to meet the state energy targets. Almost all states have now set individual renewable targets that complement those set at a federal level. This includes 40 per cent by 2025 for Victoria, 50 per cent by 2025 for South Australia and 100 per cent by 2020 for the Australian Capital Territory. In Queensland, a target of 50 per cent by 2030 is gathering momentum and support for renewable energy projects is growing. Recent examples of the exercise of ministerial powers to call in the assessment of renewable energy projects are the Kidston Solar Project (Phase One) and the Coopers Gap Wind Farm as matters of state economic and environmental significance. The 50MW Kidston Solar Project is part of a suite of 12 projects attracting A$1 billion in investment, which, once completed, will triple the amount of electricity produced from solar in Australia. In addition, Coopers Gap Wind Farm will feature 115 wind turbines with a maximum capacity of 460MW. The A$700 million project, scheduled for 2020 completion, will support 350 jobs during construction and create 20 operational positions. The federal government has continued to target economic growth programmes particularly in light of the shifting economy. Under a broad federal mandate to drive innovation, the government has identified reducing the regulatory burden on industry as a key objective. Often referred to as a policy of 'green-tape reduction', at a federal level there are significant developments under way whereby the government is aiming to repeal or amend regulation that might be viewed as stifling these economic growth objectives. Mirroring support at the state and territory level, the federal renewable energy target for large-scale generation of 33,000GWh in 2020 will double the amount of large-scale renewable energy being delivered by the scheme compared with current levels. In addition, the plan will result in approximately 23.5 per cent of Australia's electricity generation in 2020 being sourced from renewable energy projects. Support for this target is directed by the independent Australian Renewable Energy Agency (ARENA), which coordinates support for renewable energy technologies from the research and development stage through to commercialisation and deployment. In addition to marketing renewable energy projects to investors, ARENA ensures the information and experience gained from its projects is shared throughout the industry to benefit future projects. As with the state targets, major investment is expected to realise the targets being set and significant international interest is expected in this sector to help with this movement. In 2017, the federal government kick-started investment by announcing a A$2 billion expansion of the Snowy Hydro project, which has operated since 1974. To complement the focus on strengthening social infrastructure projects across Australia, the government has developed national guidelines for the delivery of infrastructure projects to promote cross-government consistency and the use of best practice approaches. Additionally, the Australian government is seeking to attract further private investment in public sector infrastructure projects to meet increased demand for infrastructure over the next decade, with opportunities for both domestic and international companies to invest. Australia's unique history and the continued connection of indigenous communities with parts of the country have led to an important cooperative process whereby traditional indigenous owner groups may be afforded a right to negotiate regarding the development of projects. A mining applicant, for example, is often required to address 'native title rights and interests' in the land before proceeding to production. Australia also recognises certain international standards. For example, the Equator Principles are an internationally recognised standard for managing social and environmental risk management within financial institutions involved in project finance. As in the United States, while there is no legal requirement to adopt this measure, some major financial institutions have voluntarily implemented the principles in their internal operations. This includes the Australian Export Finance and Insurance Corporation and Australia's four largest banks. Significantly, in light of the interest in renewables, Australia remains committed to the 2015 Paris Agreement on climate change. Australia has targeted a reduction of emissions by 5 per cent below 2000 levels by 2020 and a further reduction of 26–28 per cent below 2005 levels by 2030. As noted, significant investment is needed to meet these targets. Collectively, the laws and standards contribute to a balanced framework that protects the social and environmental aspects of commercial life in Australia. The Council of Australian governments endorsed a National PPP Policy and Guidelines in 2008, which apply to all Australian government agencies. In line with this framework, the Australian governments will consider a PPP for any project with a capital cost in excess of A$50 million. This policy framework has been supplemented by individual governments including Victoria's Partnerships Victoria, New South Wales' New South Wales PPP Guidelines and Queensland's Project Assessment Framework. Despite the policies, there remains concern regarding the level of risk transfer to the private sector, the costs incurred in bidding for PPP projects and the decision of the current Victorian government to cancel the A$5.3 billion East West Link PPP project several months after the PPP contract had been signed by the previous Victorian government. On the other hand, in recent years there have been many international contractors participating in bidding consortia for the major road and rail infrastructure PPP projects. Recent positive developments in the funding of PPP projects include the establishment by the federal government of the Northern Australia Infrastructure Facility to offer up to A$5 billion in concessional finance to encourage and complement private sector investment in economic infrastructure for the Northern Territory that otherwise would not be built or would not be built for some time and the provision by the federal government of a A$2 billion concessional bridging loan to the New South Wales government to enable it to accelerate the WestConnex project. As a large, resource-rich country with relatively high demand for capital, Australia relies heavily on foreign investment to fund significant projects. Foreign investment in Australia is regulated by the Foreign Acquisitions and Takeovers Act 1975 (Cth) (FATA), its regulations and the foreign investment policy. The Australian Federal Treasurer, through the Foreign Investment Review Board (FIRB) administers the FATA, its regulations and the foreign investment policy. The Treasurer is responsible for determining whether or not to allow certain foreign acquisitions of interests in Australian land, companies (including offshore companies with Australian assets), trusts, assets or businesses. As a general rule, FIRB must be notified of all proposed foreign investment activity unless it is below the notification threshold or a specific exemption applies. FIRB has the power to prosecute non-compliance and to unwind acquisitions deemed not to be in the national interest. Where the relevant regulatory process has not been followed, penalties and even imprisonment may be imposed. In practice, where the acquisition is found to be contrary to the national interest, the most common consequence, along with penalties, is a forced divestiture of the assets or restrictive conditions imposed on the ownership of those assets. Applications for approval are required to address the national interest considerations, including national security, competition, Australian government policies (including tax), the impact on Australian economy and community and the character of the investor. Foreign government investors (including companies in which foreign governments have an aggregate interest of 20 per cent or more) face more strenuous FIRB notification and approval requirements. Foreign investments in certain sensitive sectors (for instance, civil aviation, banking, shipping, telecommunications and media) also have additional approval requirements. The FIRB requirements will obviously be relevant for financiers seeking to take a security interest or enforce their security as the step in by the financier can amount to an acquisition of an interest requiring prior FIRB approval, unless specifically excluded by the policy or the FATA (e.g., taking or enforcing a security interest is specifically exempt from the requirement of obtaining FIRB approval in the context of certain genuine money-lending arrangements). More lenient screening thresholds apply for certain investors, including investors from the United States and New Zealand. Higher monetary thresholds are included in the free trade agreements with China, South Korea and Japan. However, lower monetary thresholds will still apply in prescribed 'sensitive sectors' of Australian industry, such as media, telecommunications, military-type goods and services, transport and the extraction of uranium. Historically, the vast majority of foreign acquisitions have received approval, which in most cases is obtained within 40 days. However, recent amendments to the FATA and supporting regulations by the federal government have increased the scrutiny applied to a proposed investment in Australia, particularly in the residential and agricultural sectors. Amendments to the FATA that became operative on 1 December 2015 saw an increase to existing criminal penalties, supplement divestiture orders with civil penalties and the ability to prosecute third-party advisers such as lawyers or real estate agents who assist in a breach of the foreign investment rules introduced. The federal government now also charges fees for foreign investment applications, ranging from A$1,000 to A$100,000 with uncapped fees of 1 per cent of the purchase price being imposed on residential land acquisitions. Approvals involving foreign government investors (including state-owned enterprises) are also under increased scrutiny, as are transactions involving agricultural land and water. Approval time frames in such cases can be significantly longer. Although only a small number of foreign investment approval requests have been denied in the past, in some cases, conditions (sometimes onerous) have been attached to approvals to ensure that the investment is not contrary to the national interest. In April 2017 the federal government announced reforms to its employer-sponsored visa programme to strengthen its integrity with the aim of supporting businesses to address genuine skill shortages in their workforces. A large number of Australian visas permit holders to work in Australia. There are specific working-visa categories that enable an employer to sponsor temporary foreign workers to work in Australia for up to four years (depending on the occupation of the foreign worker). A foreign worker must be employed in an approved occupation and have the skills necessary to perform that occupation. The employer may be a business that operates in Australia, or a business that does not formally operate in Australia but is seeking to establish a business operation in Australia or fulfil obligations for a contract or other business activity in Australia. Depending on the type of visa, an employer may be required to register as a business sponsor and demonstrate a commitment to employing and training locals. In most cases, there is also an obligation on the employer to ensure equivalent terms and conditions of employment to prevent the Australian workforce from being undercut, which means that minimum pay thresholds must be met, and market salary rates be paid to foreign workers. While there are various taxes and charges at each of Australia's three levels of government, the most substantive tax for Australian projects is income tax (including capital gains), which is levied by the federal government. Australia-resident companies are subject to a tax rate of 30 per cent of taxable profits. Similarly, branches or permanent establishments of non-resident companies are taxed at the same rate. Where a company pays dividends to a non-resident shareholder from profits that have been subject to Australian tax, no withholding tax applies. However, if Australian tax does not apply at the Australian company level, distributions of the profit will be subject to withholding tax at a rate of up to 30 per cent but this is normally reduced to 15 per cent or in some cases 5 per cent or zero under double taxation agreements. Interest expenses are normally deductible against Australian income, though thin capitalisation limits apply. Under safe harbour rules, interest-bearing debt to equity can broadly be in the ratio of up to three to one without denial of interest under the thin capitalisation rules. Interest withholding tax normally applies under a rate of 10 per cent, but in some limited cases this can be reduced to nil for payments to financial institutions in certain countries under double tax agreements and also for certain offshore debt raisings by Australian companies. Australia has a broad-based capital gains tax that applies to the disposal of assets and entities. In the case of non-residents, however, Australian capital gains tax only applies to the sales of assets such as Australian permanent establishment business assets, land and mining tenements and interests in companies where the non-resident and associates have a greater than 10 per cent interest and the majority underlying value is in Australian land, leases and mining rights. Accordingly, non-resident shareholders may generally dispose of interests in Australian resident companies without Australian capital gains tax where the company is not Australian 'land-rich' or where the interest in the Australian entity is less than 10 per cent. Various state-based mineral royalties apply to the production and sale of minerals extracted in relevant state jurisdictions. It has also extended the application of the petroleum resource rent tax to onshore oil and gas projects. Australia has a goods and services tax (GST), which is a broad-based consumption tax applying at a rate of 10 per cent to most goods, services and supplies. GST does not normally apply to exported goods. GST is typically passed on and is normally creditable in business-to-business transactions. Within some Australian states and territories, contractors who intend to undertake building and construction work and engineers who are supervising projects or undertaking design work are required to be licensed. The consequences of carrying out unlicensed work can be severe and affect the contractor's entitlement to recover payment as well as rendering it liable to prosecution. Accordingly, any foreign entrant to the Australian construction market should fully investigate whether such licensing and pre-qualification requirements must be met before embarking on a project. It is a universal maxim that where there are construction projects, disputes will follow. The Australian construction industry is no exception, given the scale of commercial activity occurring within the industry at any given time and the innovation that is involved on the projects under construction. Construction disputes are inherently complex and often turn on highly technical questions of fact and law. As a result, they are especially prone to being protracted and costly for the parties involved. There are a number of forums in which Australian construction, engineering and infrastructure disputes may be heard and resolved, either finally or on an interim basis. The primary methods utilised by disputants within the construction industry remain arbitration, statutory adjudication and litigation. Other forms of alternative dispute resolution are, however, also available, including expert determination. For the moment at least, the focus in Australia remains on dispute resolution, rather than dispute avoidance. Australia has not followed the global trend of embracing dispute avoidance mechanisms, such as dispute review boards (DRBs), given the perception that they are not cost-effective on projects under a certain monetary value. Nevertheless, DRBs have enjoyed some support, mainly on large-scale government projects. The three primary methods by which construction disputes are resolved in Australia are arbitration, adjudication and litigation, which are outlined below. Arbitration as a preferred method of dispute resolution is undergoing a resurgence in Australia following widespread reform to legislation throughout all of its states and territories. Each state and territory has introduced uniform domestic commercial arbitration legislation that essentially enacts the UNCITRAL Model Law.3 The introduction of the uniform Commercial Arbitration Acts has simplified Australia's legislative regime and enabled Australian courts to have reference to Australian decisions construing the UNCITRAL Model Law in the context of the International Arbitration Act 1974 (Cth), as well as to overseas decisions that consider the UNCITRAL Model Law. In Australia, the Australian Centre for International Commercial Arbitration (ACICA) administers international arbitration and the Resolution Institute administers domestic arbitration. Both institutes have a modern set of rules based on the UNCITRAL Arbitration Rules. Further, for international commercial arbitration in Australia, recent amendments to the ACICA Arbitration Rules address the difficulties that can arise in multi-party or multi-contract disputes by providing a mechanism by which an arbitral tribunal can join parties to the arbitration or consolidate multiple arbitrations occurring under related contracts. This is a particularly useful feature in international construction disputes, which often involve multiple parties or multiple contracts. The Resolution Institute Arbitration Rules address industry concerns about costs and time for arbitration processes by including a schedule that caps arbitrator and recoverable party costs on a scale based on the amount in dispute. With the adoption of the uniform domestic Commercial Arbitration Acts, which align with the International Arbitration Act, Australian jurisprudence has been able to demonstrate that Australian courts adopt a pro-arbitration approach and fulfil their mandatory statutory obligation to uphold arbitration agreements and arbitral awards. Australia's united legislative regime has put the country in an optimum position to continue to build its reputation as a stable jurisdiction for both domestic and international commercial arbitration. Since December 2011, every state and territory in Australia had enacted legislation providing for the interim statutory adjudication of construction disputes (commonly referred to as 'security of payment legislation'). Although they differ in content and procedure, the rationale underlying each of the legislative regimes is to establish a rapid means of securing interim progress payments to secure cash flow and reduce the instances of insolvency within the industry (which can have a cascading effect down the contractual chain on a project). Adjudication determinations do not finally determine the parties' positions inter se and payments made pursuant to them are made 'on account' only. Despite its ubiquitous presence within Australia, the security of payment legislation lacks national uniformity. Instead, the nation's legislative regimes may roughly be divided into two categories: the 'West coast model', which is intended to operate in a fashion similar to the Housing Grants, Construction and Regeneration Act 1996 (United Kingdom) and has been implemented in the Northern Territory and Western Australia, and the 'East coast model', which operates in New South Wales, Queensland, Victoria, Tasmania, the Australian Capital Territory and South Australia. Litigation is acknowledged to be a costly and often protracted process. These characteristics are only compounded when courts are called upon to determine construction disputes, with all their attendant complexities. For this reason, and given the availability of comparatively efficient, confidential and less expensive alternative dispute resolution procedures, litigation remains an option of last resort by the parties to construction disputes. While Australia does not have specialist courts in place whose sole function is to hear and determine construction disputes, certain jurisdictions (such as New South Wales and Victoria) have specialist case lists to facilitate the management and hearing of construction litigation. Judges with expertise in construction litigation are appointed to preside over these lists. In recent years, legislation has been enacted to improve the case-flow management of matters that are before the courts. Australia remains an attractive jurisdiction for both domestic and foreign investment, largely because of its mining and resources projects, as well as projects involving the construction of significant public infrastructure. The key constraints affecting Australian projects remain the availability of a suitable workforce to undertake the projects and the volatility of commodity prices underpinning project valuations. The ability of international companies to introduce their highly skilled workforce to Australian projects and reduce project operating costs will be critical to the completion of these projects within budget and on time. It is expected that the ongoing investment of Chinese and Indian companies in major Australian projects will continue to fuel the expansion of construction activities. Major infrastructure spending is under way and increases are forecast. Although the resources sector remains a dominant component of the Australian economy, other sectors, such as agriculture, tourism and social infrastructure, are rising to prominence. 1 Matt Bradbury, David Gilham, Kristen Podagiel, Ren Niemann, Tim Hanmore and Hayden Bentley are partners, and Liam Davis and James Arklay are senior associates at McCullough Robertson. 2 Power Rental Op Co Australia, LLC v. Forge Group Power Pty Ltd (in liquidation) (receivers and managers appointed)  NSWCA 8. 3 United Nations Commission on International Trade Law Model Law on International Commercial Arbitration (1985), with amendments adopted in 2006.